President Donald Trump attacked John McCain again on Twitter Sunday to complain about the late senator's ties to the infamous Steele dossier that contains the unverified allegations the Russians have blackmail material on the president. 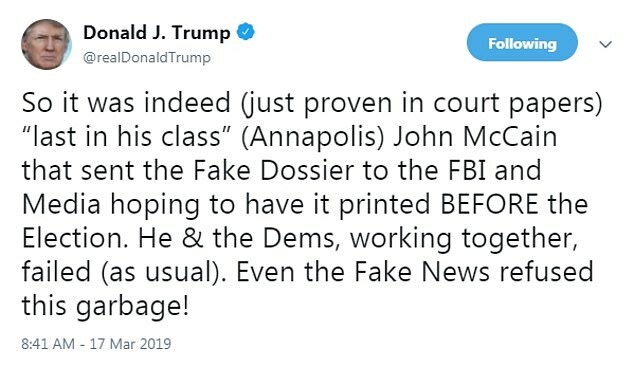 'So it was indeed (just proven in court papers) “last in his class” (Annapolis) John McCain that sent the Fake Dossier to the FBI and Media hoping to have it printed BEFORE the Election. He & the Dems, working together, failed (as usual). Even the Fake News refused this garbage!, the president wrote. 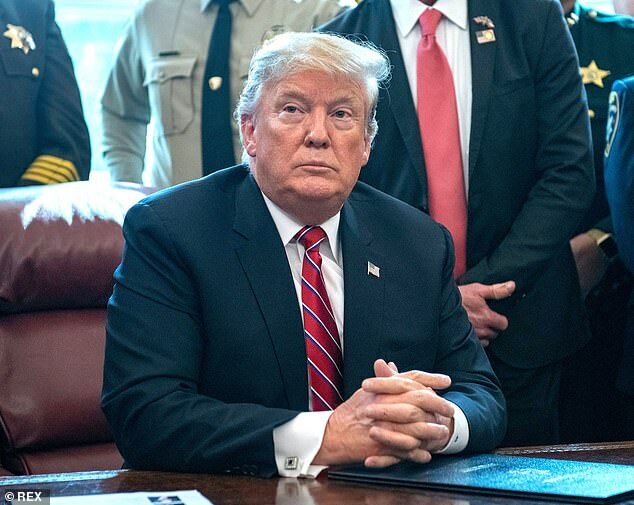 It is the second time in 24 hours the president has attacked the late senator and comes after Meghan McCain trashed Trump for going after her father. Earlier in the morning he tweeted a report from 'Fox and Friends' that Christopher Steele, the former British spy who researched and wrote the dossier, used information obtained from CNN in compiling the material. 'Report: Christopher Steele backed up his Democrat & Crooked Hillary paid for Fake & Unverified Dossier with information he got from “send in watchers” of low ratings CNN. This is the info that got us the Witch Hunt!,' the president wrote. The hosts on 'Fox and Friends' on Sunday morning said that Steele used CNN's I-report to obtain some of his material. 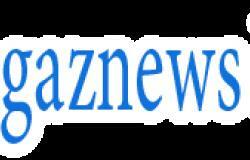 I-report is the news' organization's citizen journalism section. The hosts didn't give the source of the report against Steele. On Saturday, Trump said John McCain leaking the 'dirty dossier' was 'dark stain' on his legacy. 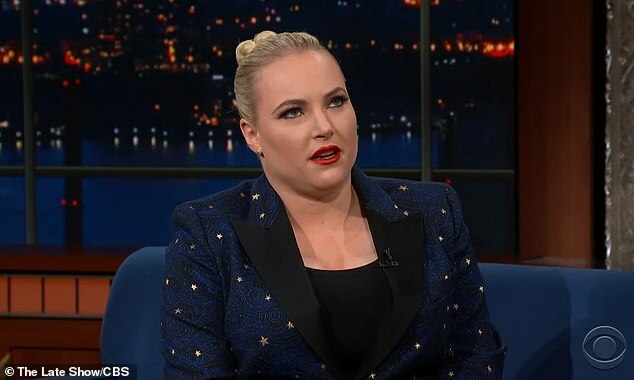 Meghan McCain slapped back at the president, saying he will never be loved. 'No one will ever love you the way they loved my father.... I wish I had been given more Saturday’s with him. Maybe spend yours with your family instead of on twitter obsessing over mine?' the View co-host tweeted on Saturday. Trump had earlier taken to Twitter to rip her father, the Arizona Republican Senator John McCain. 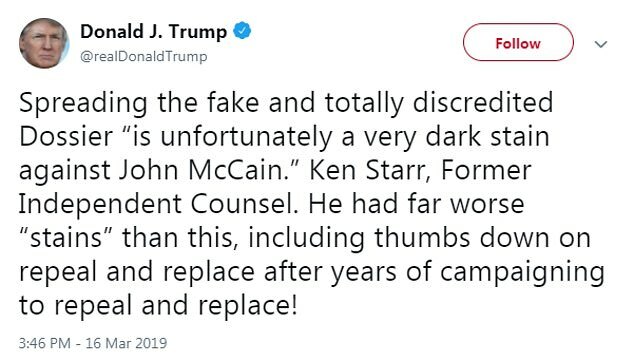 'Spreading the fake and totally discredited Dossier “is unfortunately a very dark stain against John McCain,”' Trump wrote, attributing the quote to, Ken Starr, the former independent counsel whose investigation led to Bill Clinton's impeachment. After Trump was elected, John McCain was tied to the leak of British ex-spy Christopher Steele's 'dirty dossier' on Trump, which contained salacious and unsubstantiated allegations. Two weeks later, Buzzfeed published the dossier, which landed like a bombshell just days before Trump's inauguration. It is just one incident in the ongoing feud between the McCain family and Trump clan, a dispute that Meghan McCain said last month that her father's death in September had done nothing to quell. 'The Trumps had beef with me then, and in the words of Cardi B, they're gonna have beef with me forever, and I'm not gonna forget,' she said in an appearance on the Late Show, referring to the rapper's lyrics in the 2016 song Foreva.